Lisa Adams takes us down a familiar path that is strewn with objects both mundane and transmogrified; the commonplace is ruptured by banalities. 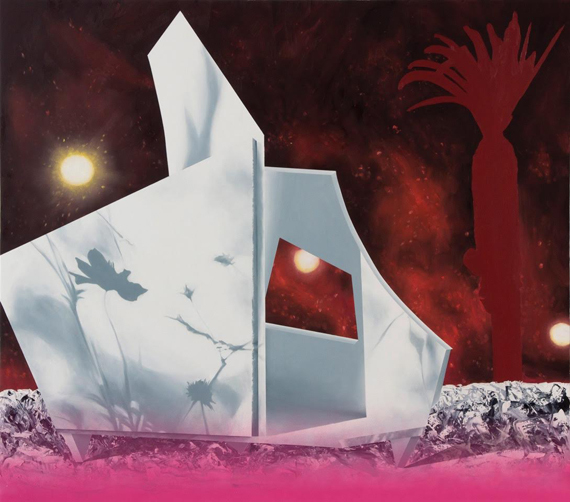 Last year Adams exhibited the work of her solo show under the larger title, in the Land of Entropic Beauty, where clashes of color and texture elevated abstracted symbols to her splendorous imaginings. This year Adams corrals her seemingly disparate natural and manmade phenomena to a more singular point of view in her new show, America the Beautiful. Degraded Material, shows us a draped American flag, the kind that looks a little tired after having been pulled out of storage for a special occasion like a 4th of July parade; it is ready to go back folded into its box. 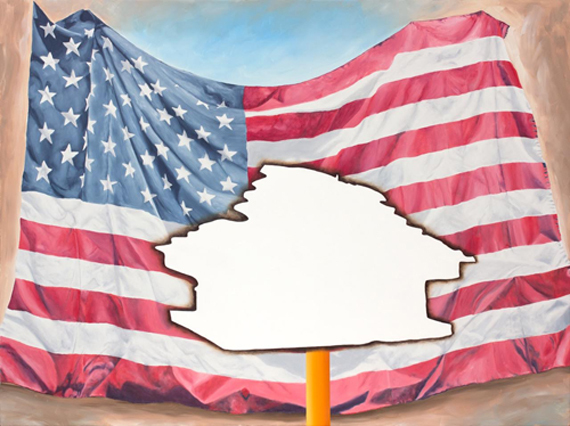 Superimposed in front of the flag is the wood block burnout silhouette of a house that has been emptied out to nothingness. The contents completely zeroed to a white out. The house sits on a thin pole akin to a yellow school pencil No. 2 and the American dream sags in the loss of ideals that could be as far ranging as the 2008 crash to California's housing crisis and education degradation. Caput Mortuum, displays an alien landscape with its red sky and three moons. A John Lautner homeless shelter is surrounded by an aluminum shrub and earth that you can feel crunching underfoot. Pool light reflections play across its surface that double as designer inspired apparitions. A graffiti pink hues the foreground while ghostly palm trees block out the stars of the night. It's an LA landscape from another dimension where an amped out desolation is turned into cool moderne. A tree trunk rises to an unseen -- unreachable landscape through an attic floor to the heavens, in Dark Star. Surrounded by phony constellations, two other truncated trunks are connected by a rainbow umbilical cord that thrusts a frustrated arc landing in a trunk slit instead of a pot of gold. A reverse visionary mirror reflects leafy upside down greenery that is Photoshop masked away from vivid darkness. A ceiling floor that serves no purpose other than to let a tree continue its growth follows the theme of illusions to Potemkinville USA, with a clearing that reveals a homeless shelter and a half-hearted attempt at a painting repair. The façade of appearances that all is ok is shabbily surrendered by a torn white flag. Adams has clearly reached for new territory in this show, mastering layered levels of meaning, technique and allegory anew. It is Borderland that synthesizes best the external/internal world she communicates, a painting that is literally divided in two by its duo canvas surfaces, the left side farsighted and the right nearsighted. As if giving a zoomed out view of your Google map, the farsighted perspective shows an Arctic bank, green graffiti grass and a dissolving wall that stretches on forever or to nowhere. The beam of a spotlight interrupts the sky while a black orb (that references Adams' own The Mire of Epiphany, a flat black disc that sits in a cloud filled sky) hangs in a tangerine sunset. Travel to the nearsighted right panel and a decoy swan inspects a man with big hands and binoculars. The man looks more local than tourist as he inspects the borderland wall with its paintball explosion remnants of faux war play. Almost claustrophobic, the nearsighted landscape evokes feelings of man created urbanity where bird watching can hardly exist yet is still a hobby. When the painting is viewed in all its multifocal glory, what is conveyed is the disruption of society not only in nature but also within our own displacement. An LA artist for decades, Adams hints at her hometown throughout, travels to Angeles Crest Forest and Skidrow, pop up enigmatically, themes of homelessness and dysfunction merge with native skies, trees and lights. These amalgamations are a mash up of threads of conversations, Instagram visions found on street corners, internet link diving and poetic cinematography. 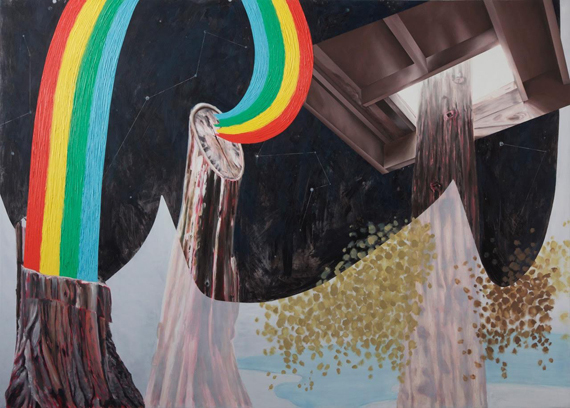 An acid trip of her internal making, Adams collages a fantasyland that does its own kind of truth-fortune telling.